Volvo has showcased its latest concept car - the 360c. Like most concept cars today, it's a) electric, b) autonomous and c) looks futuristic. But Volvo has not stopped there. It has gone ahead and removed the steering wheel and other mechanicals controls altogether and turned the available space into a bedroom/mobile office/living room/entertainment space, depending on your needs. Now, there are two very important questions which arise from this piece of information - how and why. 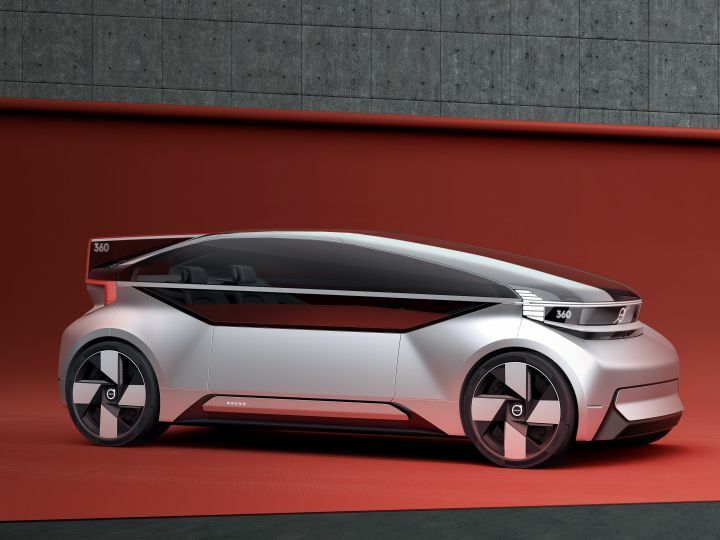 With the 360c, Volvo intended to create a fully autonomous, all-electric car without a human driver. For that, it has called for a new global standard in how autonomous vehicles can safely communicate with all other road users, irrespective of the make or model. But till that happens, the 360c will keep a keen eye on human-driven cars as well as other walking, running and jumping living creatures on the road to make sure there is no untoward incidents. Moreover, the car will display clear signals to indicate what it's about to do next so other road users are aware of its path. What’s more? The entire cabin has been emptied out to make space for the four different configurations with different types of furniture. Yes, you read that right. If you choose to customise the 360c as a bedroom, you get a business class-like seat to relax and take a nap. And while you are napping, your safety is taken care of by a special safety blanket. It works just like a three-point safety belt but is wrapped around the passenger while he/she takes a nap. If you are a suit-clad business honcho, then Volvo gives you the option to spec a mobile office. It gets a tall centre table with digital screens on the windows which allow you to have presentations on the go. The living room or entertainment space comprises of a less formal setting with up to two or four seats with a lower centre table to hold your champagne! Based on the press release, it seems that the good folks from Sweden don't like travelling by air very much. And the 360c is Volvo’s alternative to the "inconvenience of airport security, queuing, noisy and cramped airliners" by providing an "attractive travel option that could rival air, bus and train providers, but with competitive advantages in comfort, convenience and privacy." In short, Volvo plans to make the 360c an intercity commuter in which you can have four potential uses of autonomous driving vehicles. Volvo also suggests that such vehicles should be provided as fleets by corporates for their employees. And that with the ease of autonomous modes of travel, long office commutes won't be a hassle anymore. It also says this will "open up possibilities for more residential freedom, reduced pressure on real estate pricing and more affordable home ownership." While all of this is still too far away into the future, autonomous and electric vehicles are not. If you are interested in such cars, do have a look at the links below.